HomeSermonsSecond Chance for Them ?? Second Chance for Them ?? When I was a little girl, we had a game called Simon. Popular in the late 1970s and early 1980s, the game would show a pattern, you were to follow the pattern. If you got it right, you were given the next pattern with an additional tone. If you got it wrong, you heard the buzzer noise. Then you would try again. Simon offered turn after turn, more tones for correct patterns, and more chances for incorrect one. Simon was the beginning of electronic games, but it was also an incredible symbol of mercy and grace, of second chances. 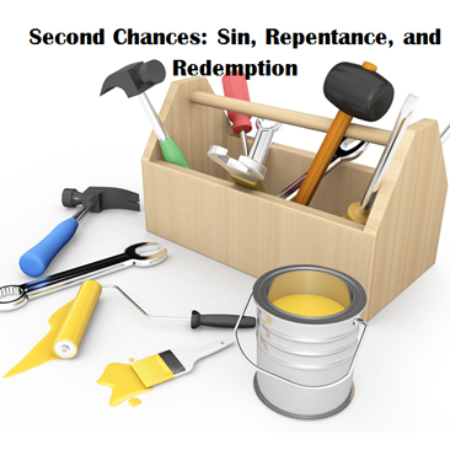 This July, we are in a series of sermons about second chances: sin, repentance, and redemption. We are taking sin seriously in ways that we might not have considered before. Leaning on Barbara Brown Taylor’s book, Speaking of Sin, last week, we explored sin as our way to hope. This week, we are looking carefully at who it is that we do not give second chances to. I recall a conversation with a parishioner of a former church who described to me with disgust an Uncle Dave. The story went that Uncle Dave was not to be admired. He had been a pretty miserable human being and treated all of those he came in contact with, similarly. He lied and cheated. He used family, friends, and co-workers to get ahead in any small way. He spoke slanderously about everyone. His niece telling the story was pretty disgusted by him, but she felt some sense of dedication to her father’s brother. The impetus for her reflections on Uncle Dave was his recent death. She was flabbergasted that just before his death; he had begun to offer sincere apologies for his harm. He had confessed his sins against God and others; he repented fully and heartily. He experienced the incredible presence of Jesus in ways he tried to describe. Then, he died. Shocking for his niece, all around. She did not want it not to count. He was not supposed to get another chance. She was upset about his ‘deathbed’ confession. She could not understand such radical grace that would accept even, Uncle Dave. When you and I are honest, we also find ourselves upset about deathbed confessions, last-minute repentances, and second chances that seem too generous. Culturally, we have already decided who should receive a second chance and who should not. Religiously, we have parsed the word ‘all’ to mean most, but not that particular individual, or that particular group. It is not just that God’s grace and mercy is for all. It is that God’s mercy is for each. It is not just that God created and loves me. It is that God created and loves each and every one of the other me’s as well. Most of us, if we are honest, even when we watch the pattern on the electronic game, Simon, even when we hear the radically inclusive love of Jesus, find ourselves drawing clear lines about whose sins get second chances and whose are just too much! We have wondered, those with anger, should they have a second chance? We have wondered, those with grief, should they have a second chance? We have wondered, should those who are black or brown, those who are young or old, those who are agitated or righteously indignant, should they have a second chance? We have wondered, those who have despaired after a lifetime and a half of being beaten down, should they have a second chance? And after a second chance, why a third, fourth, or fifty-sixth? This last week, the buzzers have been going off time and time again as we have missed the pattern. The buzzers went off again as young black men were killed. The buzzers went again off as police officers were killed. The buzzers went off again as you and I drank another cup of coffee, just hoping that the news would change. The buzzers went off in St. Paul, Dallas, Baton Rouge, but they also go off in West Grove, Oxford, Kennett Square, Elkton, and Newark. The list is long, and sometimes overwhelming. The words of Matthew’s instructions call to us in this time when we would rather imagine that we have no role in what has gone on around us. We would rather imagine in shock and horror that the list of deaths of black and brown men and women is a one-time tragedy that we have no relationship with, but can generously offer our prayers. The only problem is that the gospel from Matthew stays under our skin reminding us that we have more to do than just tsk, tsk, tsk, and mutter, ‘what a shame’. The truth is we already knew there was more for us to do than shaking our heads and hope it goes away. Each and every one of us knows in ourselves and in those we relate to, there are kernels of missing the mark with brothers and sisters who are different from us. The truth is that we have laughed at hurtful jokes and we have avoided conversations, rather than responding. The truth is that we have thought less than beloved thoughts and responded in ways that acknowledged the otherness and not the image of God in our brothers and sisters. The truth is that we are not as far from our brothers and sisters who have wrought violence as we would like to be. The truth is that we are not as close to our brothers and sisters who received violence as we paint ourselves to be. When we are vulnerable and honest with one another, we know that we too have sinned. It is not just that you and I as individuals seek the pattern, way, and will of God. We live in community. We together as a community seek the pattern, the way, the will of God. Sin is not just individual. Avoiding sin is not just that you did not murder your brother or sister. Avoiding sin is not just that you did not think of murder, contemplate hurt, or justify offense. Avoiding sin is turning away from culturally conditioned systematic ways in which we have placed some of the people made in the image of God above other of the people made in the image of God. Sin is corporate. Systematically, we have failed and need second, third, and fifty-sixth chances to live together as the beloved of Christ. Our country has internalized bad laws that were later repealed from slavery to Jim Crow, from implicit bias to supremacy, from corruption to hate. Our country has particular sins of division, of racism, of violence and of wrath. Fear and anger have been birthed from the corporate and systematic sins. But we are not beyond second chances. We are not beyond redemption. But, we need one another in this conversation. We need one another in this solution. We need one another for hope. If you have begun to form these words in your mind, “I was not there; it is not my fault. I am not racist; I have friends of other races. It is a shame, but nothing I can do,” we need you, too. We need to hear those who are calling us to re-hear the parable of the Good Samaritan beginning with these words: In reply Jesus said: “A man was selling CDs outside a convenience store… “A man was driving in car with his girlfriend, her daughter, and a broken taillight… “A man was standing guard at a peaceful protest…” We need those who have begun this path towards wholeness, those who are terrified. We need those who think there is no hope, and those who know that only in God is there hope. We necessarily affect one another. Even when we are merely observing, we affect one another. This has been confirmed in modern physics as well as in social sciences. The observer effect is the way in which you change the environment, just by being present. Each time, you observe painful acts of discrimination or subtle brushes with exclusion, you have the power to offer change. In the spirit of the gospel lesson, each and every one of us is called to offer guidance to a brother or sister, in gentle love. It is not enough for one of us to know inclusive love in our minds. We must act it out person by person, step by step, system by system, and community by community. It is the work of the church to offer hope and grace in this time when all we can imagine as a culture is more of the same. It is the work of the church to be willing to offer second chance every time a hard conversation goes off the rails with comments that are inappropriate, awkward, or uncomfortable. It is the work of the church to offer more than just our personal experiences and to remind one another that the work is necessarily corporate, that corporate and systematic sins can only be dismantled, repented of, and redeemed in corporate ways. It is the work of the church as we continue seeking the pattern of life that God has laid out for us, to hear the buzzers when we have gotten it wrong, and turn back to God’s pattern. Friends, I pray that the end of these particular buzzers is coming soon, but I also know that my prayers are answered and fulfilled when I follow the urgings of my heart and movement in my soul to affect change, even when I am uncomfortable, to offer second chances, even when someone might not be worthy of it, and to live God’s love, even when it runs counter to what I already decided about limiting God.